but everyone can do yoga actions. For some, yoga appears to be a pretzel-bending physical practice for those with flexible bodies. This is far from the truth. Yoga postures emerged in response to an understanding that tension, tightness and painful suffering can be alleviated and eliminated by tapping into the body’s cellular healing capacity. Our bodies always tell us the truth about what we are experiencing. Unfortunately, we are often too busy or too blind to pay attention. To better utilize our body’s innate ability to heal, we must awaken to how it speaks to us. Yoga poses (asanas) help us to discover where our pain and tension lie. Yoga actions, such as release the thigh bone back and the shin bone forward, take us deeper into our inner experience thereby bringing us ever closer to the source of our suffering. Yoga actions also help us to concentrate our awareness in the present moment. Through this intimate mindfulness of our direct experience, we learn what truth is. a deeply-rewarding sisterhood filled with peace, love and joy. As always, journeys of creation and discovery, whether on or off the yoga mat, take us beyond the scope of our imagination into the Universe’s intentions and gifts. In our attempt to make yoga accessible for everyone, our approach is not to teach you how to do each asana (yoga pose) in a striving for excellence, but rather enable you, through the use of yoga actions, to dig deeper into your inner experience and awareness. If you so choose, yoga awakens us to every aspect of our being—spiritual, physical, intellectual, communal and emotional (S.P.I.C.E.). By applying these offerings of muscular, skeletal, organic and breath actions, you will experience transformation from the inside out and the outside in. The beauty of each described yoga action is you can use it in any pose to experience the benefits of both the pose and the action. Strengthening and aligning our human ‘container’ establishes the solid foundation we need to understand and integrate the remaining seven limbs of yoga. 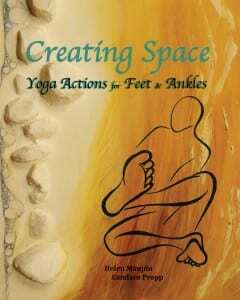 Our six-volume series of print and e-books, Creating Space: Yoga Actions, emphasize primary actions for such areas in our bodies as Feet and Ankles, Legs and Knees, Pelvis and Psoas, Torso and Spine, Shoulders and Arms. Within every volume, each action is described and visually demonstrated through a Pre Pose. What follows is a practice sequence of Peak and Plus Poses to further expand your experience of the action. Finally, we end each sequence with Post Poses to fully relax your body and integrate your asana experience. 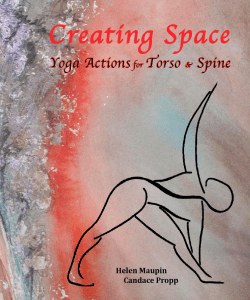 In our e-book editions, when you click on the photo image of any pose, you link to the glossary of asanas providing its English and Sanskrit names. As a starting point, we suggest you read the action and apply it using the Pre Pose. You may not immediately feel the action in your body, but continue using it for the sequence (Peak Poses and Plus Poses). In our own personal experience of practising with yoga actions, it could take two or three poses or a full practice before awakening the area of emphasis. Gaining patience and personal commitment are two significant rewards emerging from the many wonders of a yoga practice. As you view the photographic images of poses you may notice quite a difference in how we (Candace and Helen) physically express the same posture. In reality, most people come to the yoga mat with either a “plant” or “stone” body. As Candace can attest, those with a plant-like body are more flexible and loose in their joints. A benefit of such natural flexibility is a greater ease and depth achieved in the postures. However, without the necessary muscular strength to support proper bone alignment, this body type can be vulnerable to joint injury because the sensory clues when overextending are very subtle. On the other hand, Helen came to yoga with a stiffer, stone-like body. The stronger, tighter muscles of this body type provide significant sensory signals when moving too deeply into a posture. The key to avoiding injury for both types is to balance strength with flexibility. Typically, this requires those of you with plant bodies to build your strength and those of you with stone bodies to increase your flexibility. We do hope you enjoy and benefit from the gifts below that emerged from our collaboration.